Please join us for our science carnival! Make rockets, slime, dry ice bubbles and more. Admission is free. Only 4 1/2 days until online bidding begins for Buri Buri's 3rd annual Silent Auction. Have you had a chance to preview the catalog? There are over 150 awesome prizes including summer camps for kids, getaways for mom & dad, and fun activities for your students with their favorite teachers. More prizes continue to be added daily. Register today and, while you're there, visit our Fund-a-need page. 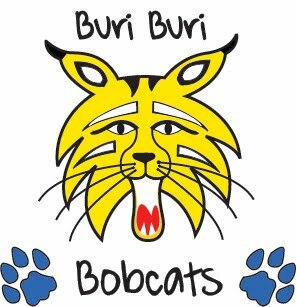 We are aiming to bring Education Outside to Buri Buri next year so that all Bobcats will experience hands-on science classes in our school garden. A donation of $5, $10, $20 or any other amount will help us reach our goal! 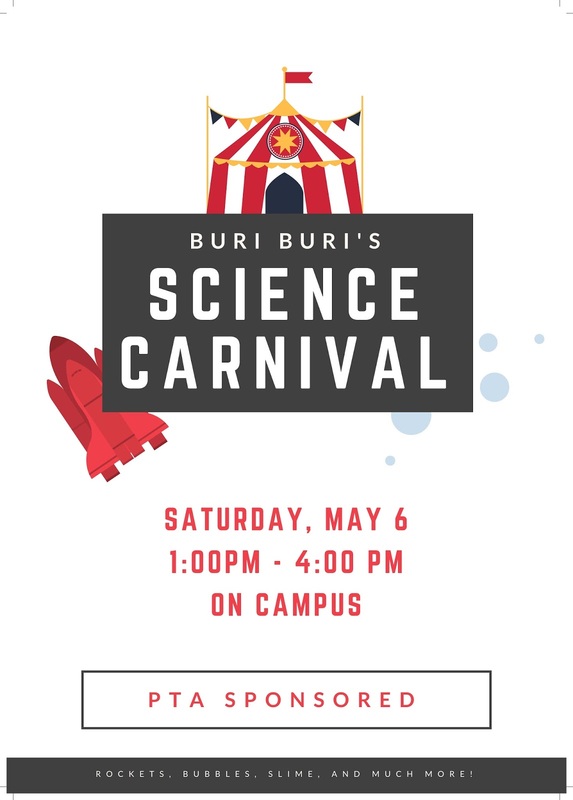 Our exciting PTA Science Carnival is coming up on May 6 from 1-4pm. We are taking over the school campus and turning it into a fun interactive science experience! We will have activities in each building and on the playground. Here are just a few of the fun things we will have: make slime, stomp rockets and drinking straw jets, play with dry ice, learn about optical illusions, compost, bubble magic and more! Even if you can't help out, please come to this fun, free day! We will also have our school auction at this event. Lots of amazing prizes and experiences to bid on including restaurant certificates, hotel stays, special class art projects, one of a kind experiences and more! It's that time of year again! Please sign up here to help out at the end-of year picnics. Picnic dates in link. We need lots of volunteers so please sign up! Restaurant Night will occur at Chipotle, located at 990 Serramonte Boulevard, Ste D in Colma on Tuesday, April 18, 2017, from 11:00am – 9:00pm. Come get some fantastic burritos, tacos, etc..., for a quick and easy lunch, snack, or dinner. These Restaurant Night fundraisers provide a wonderful opportunity for Buri Buri families to meet other Buri Buri families in your community. Enjoy great food in the dining area or take it to go if you wish. Click HERE for a Printable Flyer Please make sure to either present a physical flyer, a digital flyer on your phone or tablet, or notify the cashier upon ordering that you are there to support the Buri Buri Elementary School PTA Fundraiser, so that we can collect a portion of the proceeds. Thank you for your help in making this event a success! Please send us an email with your thoughts regarding Restaurant Night at buriburipta@gmail.org. All suggestions are welcomed. Let us know where you’d like to see the next Restaurant Night. “Bust a Move!” Learn popular hip hop dance moves exploring tempo, rhythm, and improvisation. Class includes a performance for friends and family on the last day (May 23). Kids learn from professional dance choreographer and former Golden State Warriors cheerleader, Shonna Chiles. Free t-shirt included. Pick up strategies and tactics for critical thinking, as kids learn the basics or build on their chess skills. Logic puzzles help students learn the rules of chess and how to become a chess master! Students of all levels are welcome – beginners, intermediate and advanced. · 2. Click on the LEAP Registration Button at the top of the page. This will take you to the Buri Buri – DCP Reso page where you can choose the class(es) you want and complete your registration. Please join us tonight for our PTA meeting and elections! We will also hear an update from Principal Dye about our school dashboard ratings, science carnival plans and end of year picnics. We would also love for new parents to be more involved with the PTA next year. A position on the E-board is a great way to contribute to our wonderful community at Buri Buri and to make good friends in the process! Time commitment: Varies based on your availability and position you choose. We have E-board meetings monthly on the third Thursday of every month. Some people only attend a few, some attend all. Some bring their kids, some call in to report. PTA Unit/General meetings are on the first Thursday of September, November, March, April and May. The PTA would like to thank our individual donors for your generous donations! The PTA would like to thank all of the students who participated in fundraising. Those listed below raised over $50.